One of the most significant variables impacting boiler optimization to improve energy efficiency is ensuring the complete combustion of fuel. Boiler combustion air blowers have a few functions, including introducing turbulence in the firebox, which promotes complete combustion and maintains metal surface temperatures in the firebox and boiler tubes. Without the blower, tubes would overheat and rupture. The ideal fuel-air mixture is the stoichiometric balance point at which all the fuel is used for combustion. Too little air results in incomplete combustion of the fuel, which wastes a valuable commodity purchased with the department’s operating budget. Too much air results in more heat removed from the boiler than is needed, resulting in removing energy from the boiler that will need to be re-introduced. The typical value to ensure complete combustion without excessive loss is 10 percent excess air — more air than required for stoichiometric combustion — throughout the entire firing range. As the boiler load varies throughout the day, the needed mix of fuel and air changes. Continuous monitoring of oxygen (O2) is the best way to optimize this ratio. Operators can use carbon dioxide (CO2) or carbon monoxide (CO) as an indicator of available oxygen in the products of combustion. Tracking O2 content in the products of combustion minimizes fuel input required to satisfy the heating load. Optimized excess air — the O2 level — can reduce annual fuel use by 5 percent on average. Another significant variable to control is the energy leaving the boiler in products of combustion through breaching. A high stack temperature indicates energy is not transferring to the water. If operators trend stack temperatures and find they are rising over time, this can indicate heat-transfer surfaces that need cleaning. High stack temperatures — combustion products of more than 600 degrees — result from fouled heat-transfer surfaces or a process that provides more combustion air than required. Stack temperatures of 350-450 degrees are more typical. Cleaning heat transfer surfaces via punching tubes and proper water chemistry can reduce stack temperatures and the parasitic losses associated with it. A third control strategy involves optimizing the purge cycle and modulating the burner at a lower continuous level rather than cycling the boiler on and off frequently. Pre- and post-purging of the boiler’s firebox is required to safely ignite burners, but operating the burner continuously at a lower setting can minimize the number of purge cycles. 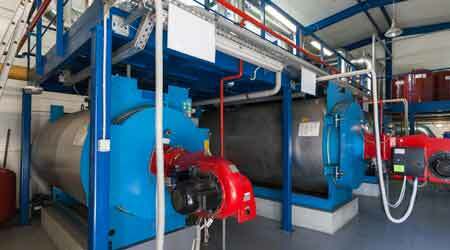 Boiler operation can be as simple as on/off or high/low/off, but the number of purge cycles can be significant. A burner’s effective range of firing has been improved from 4:1 to 20:1 with the advent of direct digital controls and technology enhancements. The savings associated with continuous operation, with limited purge cycles, are in the range of 1-2 percent of annual fuel consumption. It is a low-cost measure for a worthwhile energy efficiency upgrade. The final control strategy involves reducing steam pressure or scheduling heating hot water based on outside air temperature. To implement one of these measures, operators need to validate the load requirements. What is the actual thermal load of critical systems? This figure includes both pressure and energy rate in Btus. In hospitals, the autoclaves used for instrument sterilization can be a critical load. Elevated temperature and pressure figures at the point of use are required. To determine if this ECM is viable in a particular setting, operators need to verify a building’s critical loads and available steam quality at the point of use. Lowering steam pressure by 75 psig results in a 1 percent savings on annual fuel input. If a heating plant generates hot water, operators can establish critical-load requirements in a similar manner. If the current control strategy is to supply a constant 180 degrees throughout the heating season to satisfy comfort conditions, then scheduling this heating water based on outside-air temperature is a simple ECM. Operators can start with 180 degree water at peak heating load — say, 0 degree outside air — and 120 degree water for the minimum heating load — say, 50 degree outside air. Operators can further refine this schedule depending on the thermal mass of the building and its internal loads. Savings from hot water reset can be 5-15 percent of annual values.